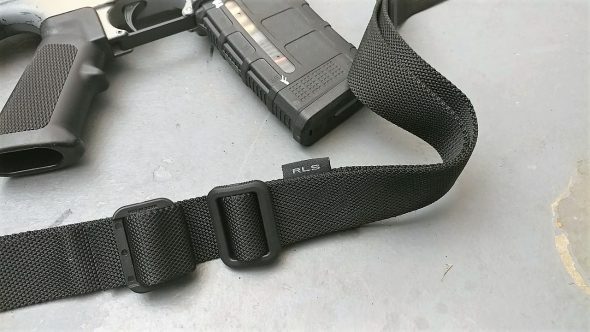 The Magpul RLS Sling is a simple execution and evolution of the practical shooting sling concept. While we may not value the art of “slinging up” as our fathers and grandfathers did… shooting from a stable position never goes out of style. I have used traditional 1907 Pattern slings, Nylon web slings, modern quick cuff slings, etc. and now I have a chance to evaluate the Magpul RLS 1. At $19 it actually stands neck and neck with some of the cheaper 1907s and nylon web slings. How does it stack up? The RLS is constructed of a smooth tubular nylon. The plastic hardware is typical of Magpul in that it feels robust and well made. The sling is comprised of two polymer tri glides and a polymer keeper. The construction is excellent and stitching appears strong. The sling is flexible, and the material is quite supple. Magpul chose some excellent quality nylon for this product. It feels comfortable on the shoulder whether carried traditionally or African style. It is a long sling, and would potentially require trimming if you opt to use this sling on a mid-length or carbine. As it sits on my 20 inch A2, I have to almost have both tri-glides nearly touching to shorten the sling enough to my liking. I found the sling to be a well made product for shooters who still want to sling a shot. On my A2 rifle, I found the use of the product both intuitive and simple. It was possible to quickly mount the rifle with sling support by sliding into the large open loop. The second possibility is to slide the keeper down to the bicep to tighten up the sling. It will not get as tight as a 1907 (from my memory) or a nylon USGI (which acts as a noose), but it certainly is faster than older style slings. When utilized, the keeper squeezes the back and sides of the bicep which enhances the friction and keeps the sling in place that much better. The keeper slides down the sling smoothly. Installing the sling required re-threading the loose end of the sling through the keeper with a screwdriver. The keeper grips the sling tightly while still being easy to move up and down the sling. This product has it’s limitations: it isn’t much of a tactical sling. It could be used as a two point quite easily, but then we may lose some of the advertised features. Keep this sling on a long gun where it belongs. Smaller guns will have excessive sling and may need trimming, but it’s necessary to keep a certain length for the forward loop to allow slinging up. This sling is best kept on full length rifles or with rifles that have a good distance between the front and rear sling swivel. The Magpul RLS sling is a cheap, effective sling for traditional or African style carry. It has a few simple features to allow you to use sling stability to steady a shot. It has a low price point, so the purchase is fairly painless. I have replaced the USGI Nylon sling on my A2 with this sling and plan on keeping it there for my “modern” A2. Disclaimer: I purchased this sling with my own funds from Brownells. Magpul had no hand in this review. If you want a sling, here is the link. It seems like Magpul is trying to go after the more traditional hunting market these days. Maybe it’s related to their precision shooting classes. But with this sling, the recently released bipod, and even the R700 chassis systems, they look like they’re going after the budget precision rifle crowd. Don’t know if you saw it or not, but the other color offered by Magpul for this sling is coyote (not fde). I find that interesting for some reason. Thanks for the heads up on the new sling. Any more opinion from your experience? Is it faster than a usgi while still doing its job of providing support? Hey BOB definately faster but it cant get as tight as a web sling. I have moved the sling to my .308 and appreciate the speed of slinging up. It gets “tight enough” but not feel your pulse tight. I like it overall and still use it, just not on the 5.56 at the moment.